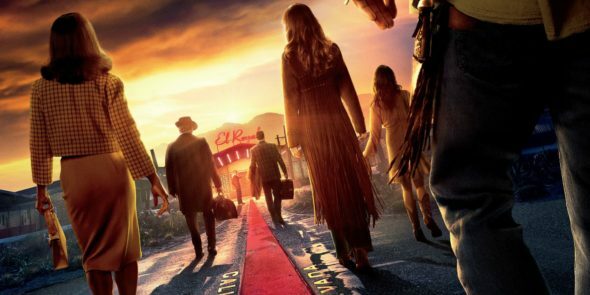 Well, one may not be a priest, the other might not be a salesman and the bar is really part of a nearly abandoned motel, but the point is all hell breaks loose in writer/director Drew Goddard’s stylish thriller, Bad Times at the El Royale. Lake’s Tahoe’s El Royale sits straddling the Nevada/California border in the late 1960s. Before the East side lost its gambling license, the El Royale had been a hot spot and Rat Pack hangout, but lately bellboy/desk clerk and bartender Miles (Lewis Pullman) is pretty lonely. Then the priest (Jeff Bridges), the salesman (Jon Hamm) and a singer (Cynthia Erivo) check in, followed by a hippie (Dakota Johnson) who’s got an F-you attitude and someone in her trunk (Cailee Spaeney). Their respective reasons for stopping at the El Royale are separate and shady, but as the characters reveal dark pasts and true intentions, the quiet hotel quickly becomes a battleground for survival. Goddard’s follow-up to 2012’s ingenious The Cabin in the Woods is anchored with the same inventive zest, and built with time-jumping back stories and placards that bring Tarentino to mind. And while El Royale can’t completely deliver on its promise, it offers a gorgeous blast of color, sound and plot twists that are pretty fun to watch unravel. The entire ensemble is splendid, each digging into their characters with a relish that only elevates the impact when our feelings about them change, and change again. Who’s a villain? Who’s a patsy? Who’s being framed and who’s just looking for redemption? Though Goddard’s pace gets bogged down at times, his visual style and careful placement of 60s pop hits make sure chasing those answers is always a retro hoot. The film’s biggest disappointment stems from the arrival of the sinister Billy Lee (Chris Hemsworth), a violent charmer who’s come to settle a score with someone in the El Royale’s guestbook. As past histories and current events collide, the film reveals a late-stage moralistic vein as hopes for a type of Cabin in the Woods-style showstopping finale slowly fade away. Those final fifteen minutes are fine for any typical noir crime thriller, but not quite worthy of El Royale‘s previous deliciously indulgent two hours.